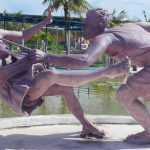 Pietà — The Michelangelo's sculpture masterpiece - Living + Nomads – Travel tips, Guides, News & Information! 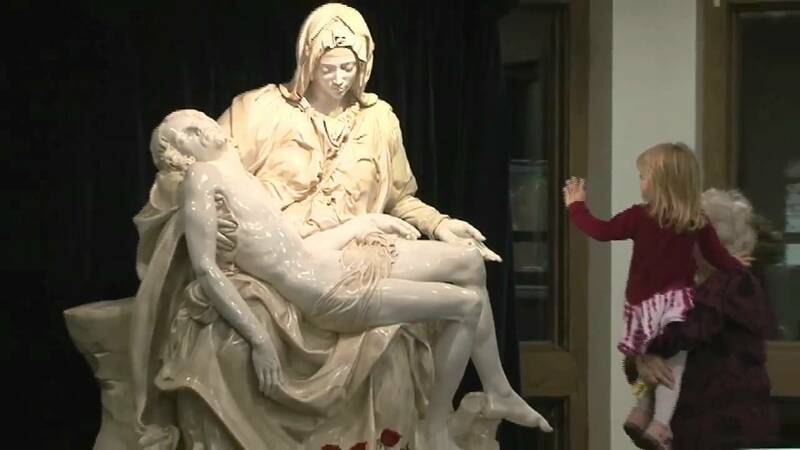 Pietà (Pieta sculpture in English) is a masterpiece which depicts the image of Mary carrying Jesus’ body in her arms, but unlike other works of the same title, Michelangelo’s Pietà has no resentment and no cramping pain. 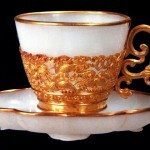 It has only the serenity, peace, holy and no resentment, showing the unlimited wisdom beyond any human emotions. Michelangelo is considered to be one of the greatest artists in human history. He is the person whose name is associated with the concept of “masterpiece”. 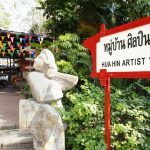 He left immortal works in the field of sculpture, painting, and architecture. With the breadth and variety of artistic accomplishments, Michelangelo has made an indelible mark on Western art creation at the height of the Renaissance. 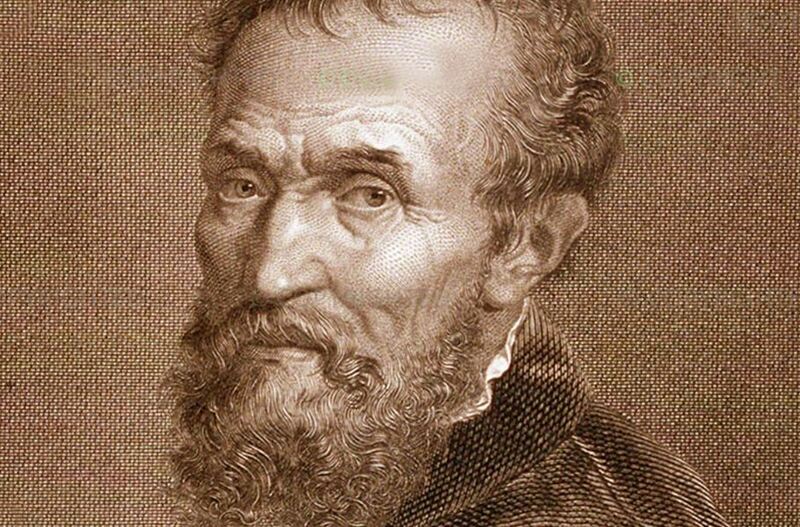 Michelangelo is considered to be one of the greatest artists in human history. 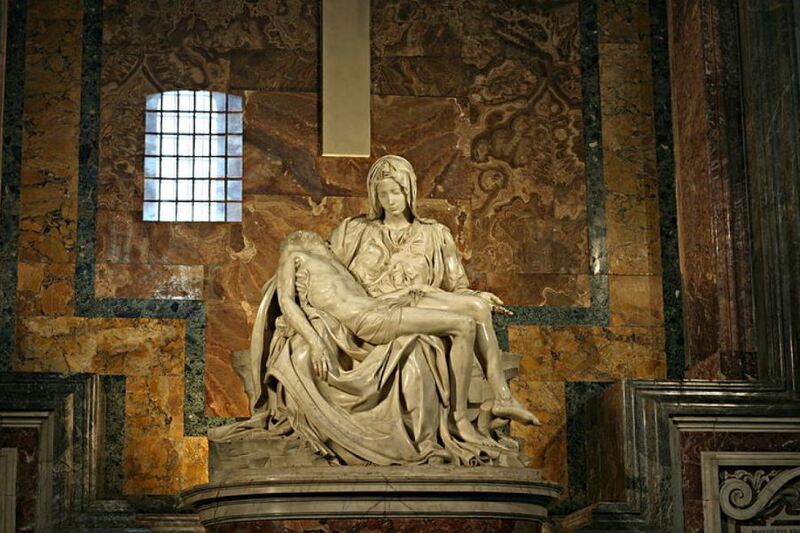 Among the spiritual children of Michelangelo, the Sistine Chapel at the Vatican is perhaps the most famous, but his finest masterpiece is Pietà, the only Michelangelo works which he left his signature. 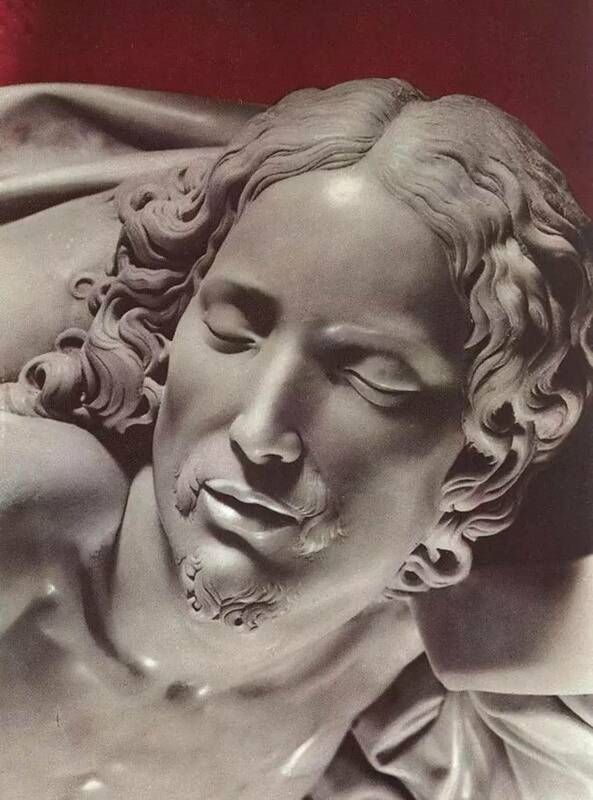 Michelangelo had done some sculptures in Florence for the Medici, but in the 90s of the 15th century, he left Florence for Venice to Bologna and then stayed in Rome between 1496 and 1501. In 1497, Cardinal Jean de Billheres entrusted Michelangelo with a sculpture in St. Peter’s.The result was the birth of Pietà – a masterpiece which brought Michelangelo’s career to the top. 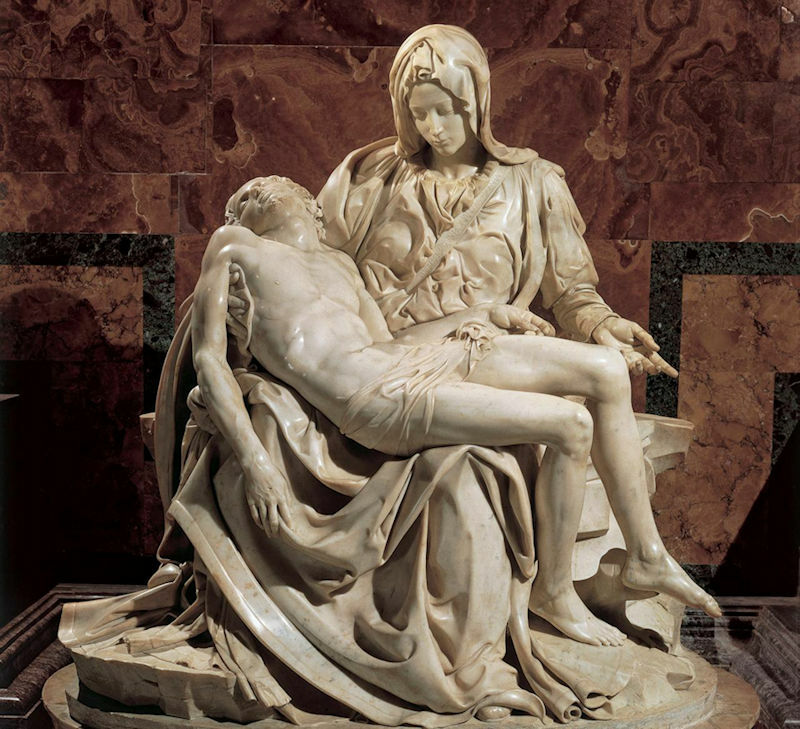 The result was the birth of Pietà – a masterpiece which brought Michelangelo’s career to the top. 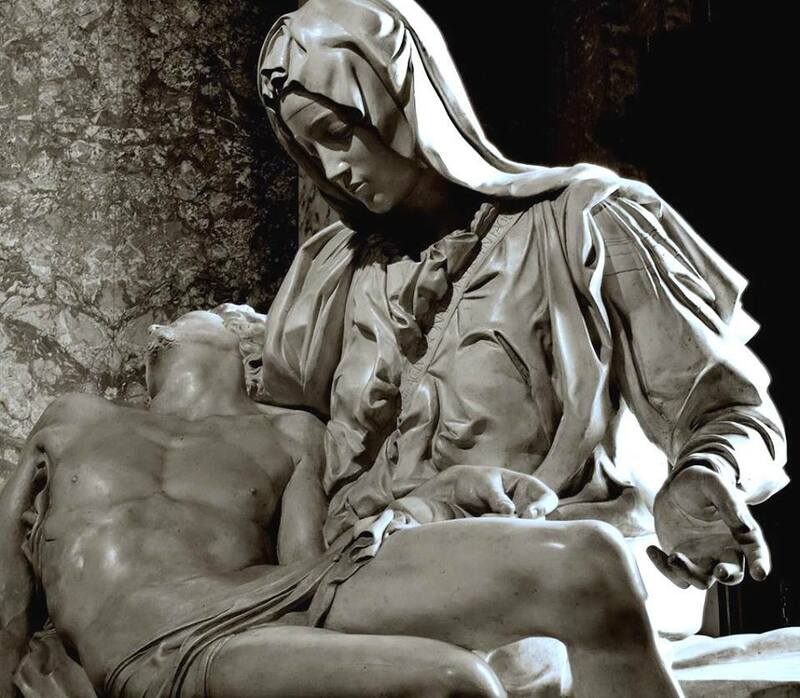 Image: Pieta sculpture blog. 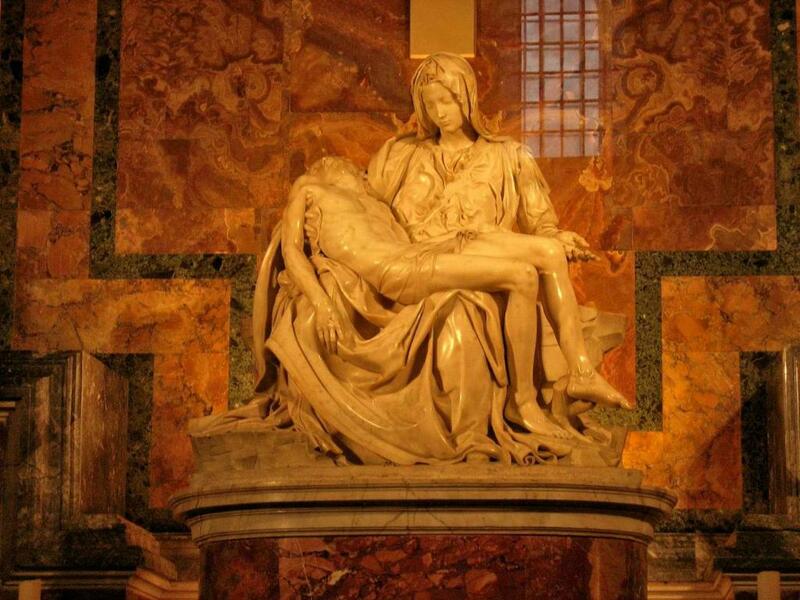 Up until now, Pietà has been placed in a solemn position in the Basilica of St. Peter’s Basilica in the Vatican, Italy. Although the size of this masterpiece is relatively small compared to the entire space of the cathedral, the beauty, emotion, and spirit of the sculpture make viewers reluctant to immerse themselves in it. Throughout Pietà is a very human and noble feeling, extremely natural and close. But above all, Pietà exudes a divine beauty that we will not find in any other work on the same subject. 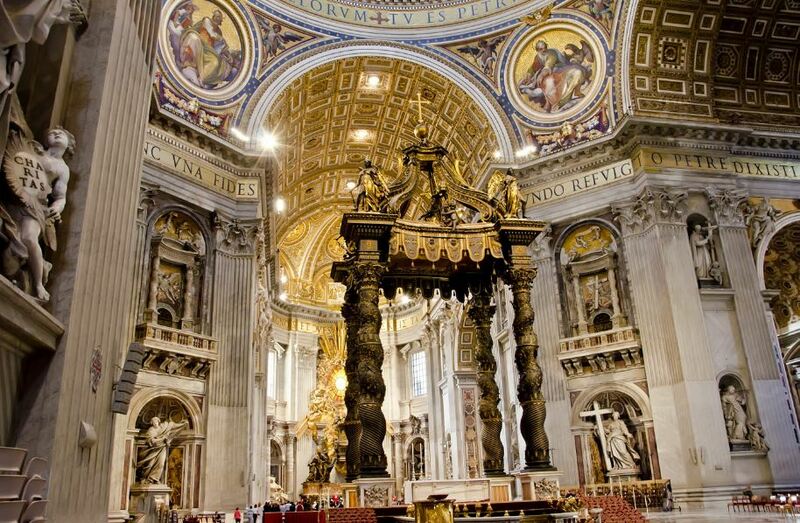 Up until now, Pietà has been placed in a solemn position in the Basilica of St. Peter’s Basilica in the Vatican, Italy. Image: Pieta sculpture blog. 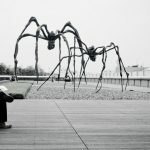 Although the size of this masterpiece is relatively small, the beauty, emotion, and spirit of the sculpture make viewers reluctant to immerse themselves in it. 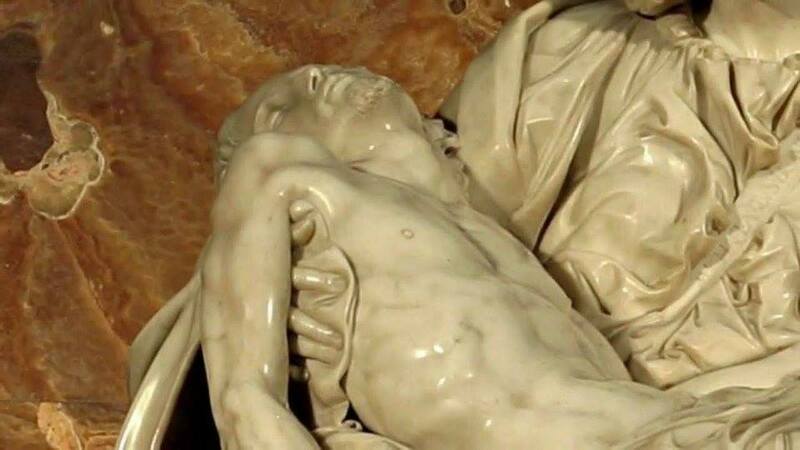 Talking about the material, Michelangelo acknowledged that the Carrara white marble which he used for Pietà sculpture was the most beautiful piece of stone he ever used. That is why Michelangelo caring for Pietà more meticulous than any other of his sculptures. 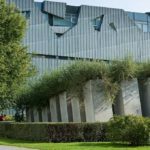 Pietà’s overall structure is pyramid-shaped which brings the balance, harmony and symmetry. It makes the viewer’s eyes be sucked into the face contains the peace of Mary. The lines used in the work make it full of energy and vitality. The hair of Jesus, the delicate folds of Mary’s dress, as well as the skin of the two have created a great beauty for the work. The hair of Jesus, the delicate folds of Mary’s dress, as well as the skin of the two have created a great beauty for the work. In this work, it is recognized that the proportions of the body of Mary and the Lord Jesus do not really correspond naturally to each other. Strictly speaking, although the head of Jesus and Mary is the same size, the body is not. The maternal body is larger than the body of Jesus, and therefore Pietà lacks the correspondence between organs. 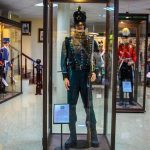 In the Renaissance, the artists tend to follow the exact proportions of the human body in paintings or sculptures or even make that proportion flawless. However, in his masterpiece, Michelangelo abandoned the pursuit of proportions to bring his sculpture a balance and harmony, a sense of completeness. Therefore, Pietà is a balanced combination of artistic principles with the viewer’s sense. In this work, it is recognized that the proportions of the body of Mary and the Lord Jesus do not really correspond naturally to each other. Picture: Pietà Michelangelo blog. The body of Mary is larger than the body of Jesus, and therefore Pietà lacks the correspondence between organs. Picture: Pietà Michelangelo blog. 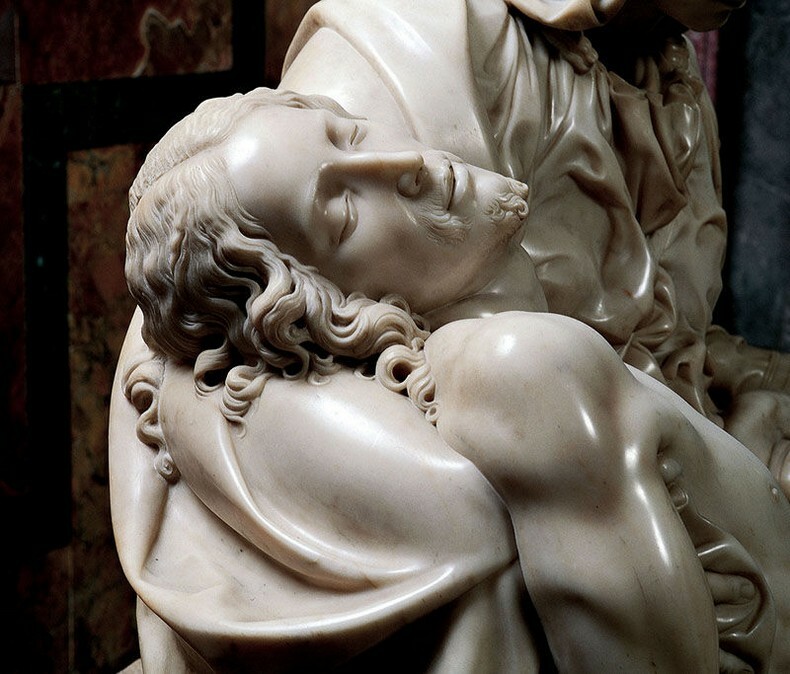 However, the implication of Pietà is what really makes this sculpture a culmination of the Renaissance. 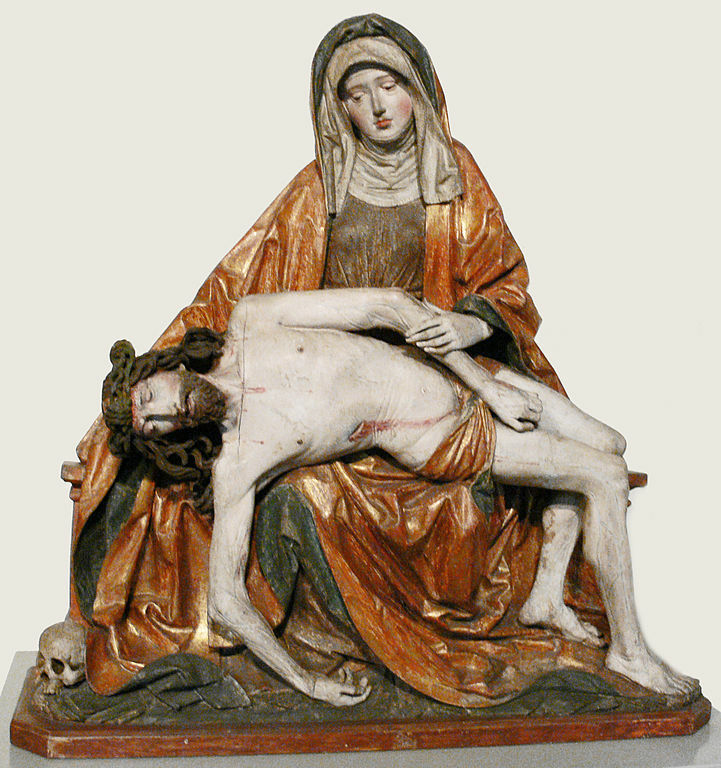 Pietà depicts Mary holding the body of Jesus after his body was lowered from the cross. This is one of the seven important events in the life of Mary which also known as Mary’s seven sorrows. At that time, the theme of Mary hugging Jesus in her arms was performed by sculptors in France, Germany, but not really known in Italy. In addition, the image that artists display often depicts Mary in the pain and suffering that Jesus suffered. 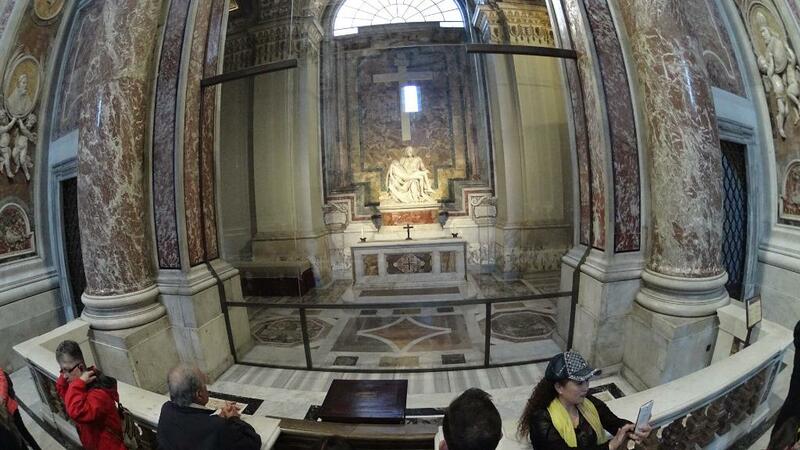 However, Michelangelo built a completely different image within his work. The image that artists display often depicts Mary in the pain and suffering that Jesus suffered. Picture: Pietà Michelangelo blog. 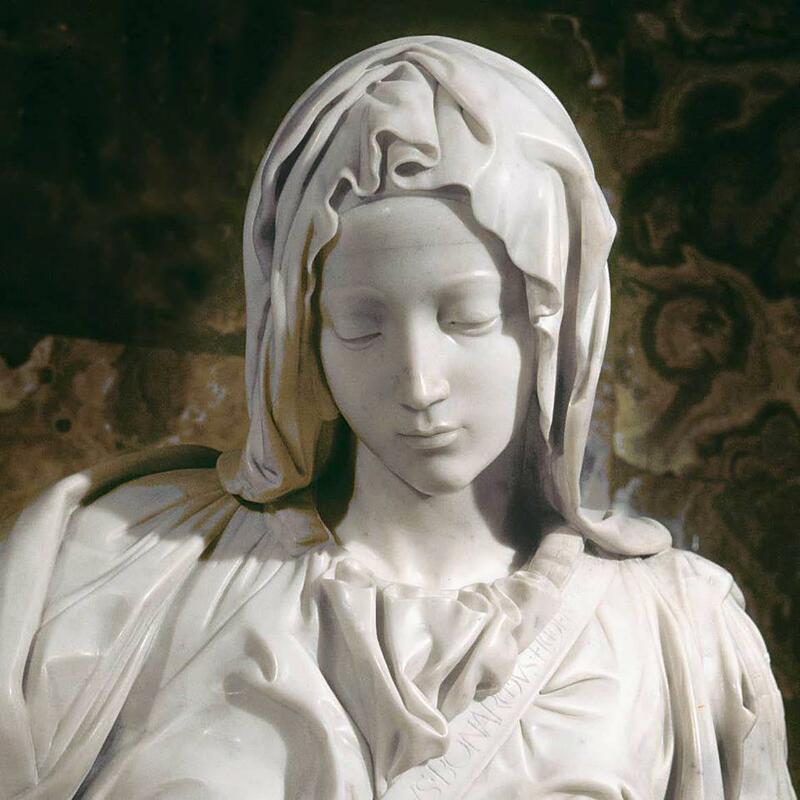 At the center of the sculpture, Mary appeared very young. Her face has no resentment, no pain and no serenity. The only thing that appears in her face is peace and purity. Mary accepted the death of Jesus in a tolerant way. At the center of the sculpture, Mary appeared very young. Her face has no resentment, no pain and no serenity. Image: Pieta sculpture blog. Jesus lay in her heart with a serene face without showing the suffering of crucifixion, only peace as he was asleep. Jesus lay in her heart with a serene face without showing the suffering of crucifixion, only peace as he was asleep. 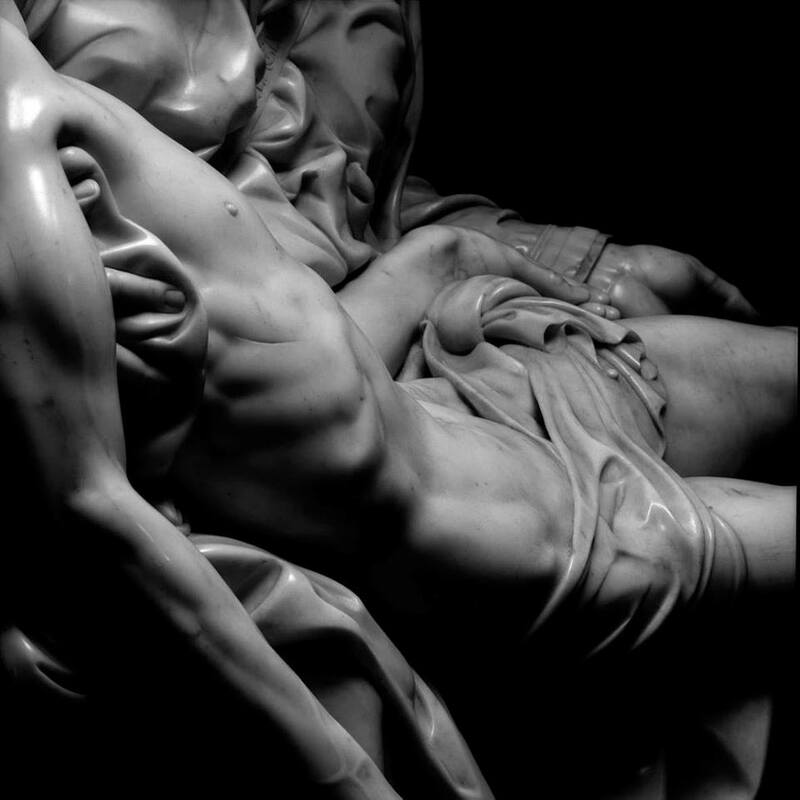 Image: Pieta sculpture blog. Mary does not directly touch the body of Jesus but uses a cloth to lift the Lord, showing the divine nature of the body. 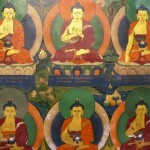 All of them show great compassion and wisdom, beyond any human emotion. Mary does not directly touch the body of Jesus but uses a cloth to lift the Lord, showing the divine nature of the body. Photo by: Pietà Van Michelangelo blog. 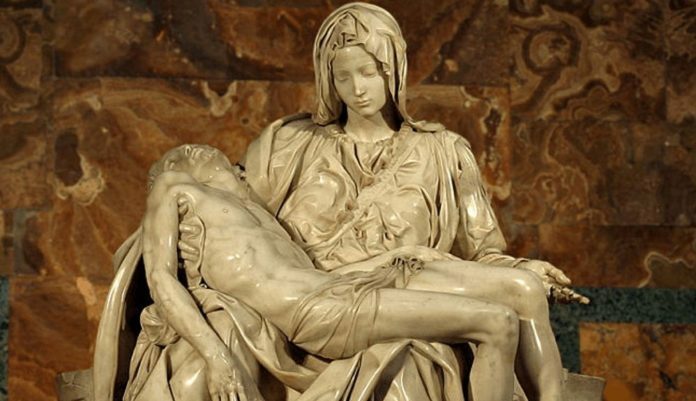 Pietà is the common name of the theme which Mary hugged Jesus in Italy. No one knows when it first appears, but it is completely different from the concept of the lamentation of Christ that other works describe. It is possible that Pietà was only popular in Italy after the publication of Michelangelo’s work. In English, Pietà means “pity” or “compassion”, but if translated correctly from Western culture into the Eastern culture, then perhaps we have to translate Pietà is “compassion”. 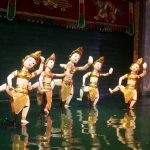 “Compassion” is a concept that the ancient people used to refer to the gods of the East, which is closest to the Vietnamese are the Bodhisattva Avalokitesvara. “Compassion” is equivalent to the concept of “love” in Western religions, which is not the love of men and women, but another concept, love, and compassion for everything. This is a concept that Western religions themselves do not have their own words to describe, but have to use the word “love”, and remain confused when explaining it. 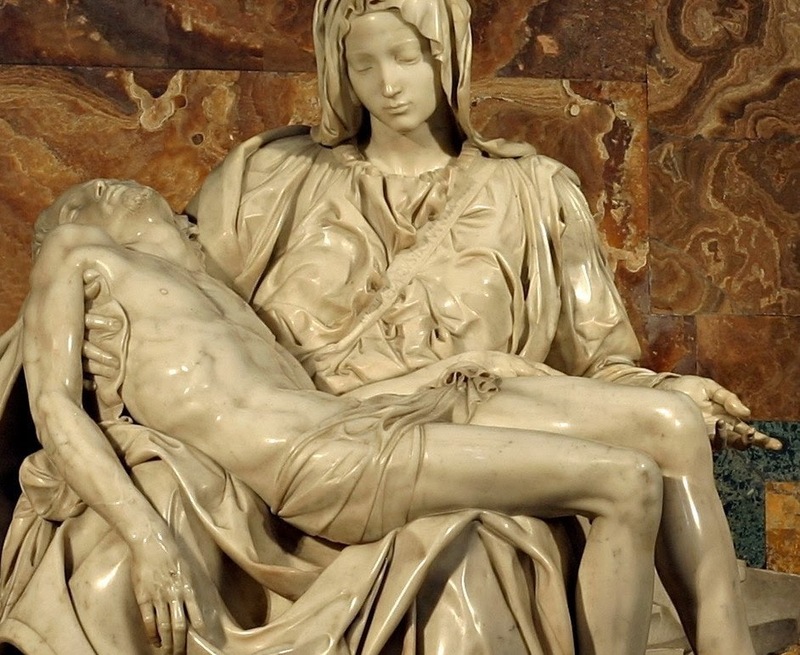 Pietà is the common name of the theme which Mary hugged Jesus in Italy. Picture: Pietà Michelangelo blog. Because of the compassion, Jesus suffered sin and suffering for man. Because of compassion, people did not see the suffering on his face when his body was lowered from the cross. It is also because of the compassion that Mary does not feel pain when she loses a child. Because of compassion, people did not see the suffering on his face when his body was lowered from the cross. Image: Pieta sculpture blog. It is because of the words “compassion” that Pietà has become a rare sculpture that can be described in a most flawless way the beauty of the Buddha, which Western language is difficult to reach. That is immortality in Pietà Michelangelo.